The Dim Sum Diaries | Two Japanese restaurants in Manila | "One cannot think well, love well, sleep well, if one has not dined well." I was in Manila last week for what will, I hope, be the first of many journalistic trips around Asia. I had previously heard numerous horror stories about Manila so I must admit I was a little bit nervous. I did, however, have the pleasure of staying in two very nice hotels, namely the Dusit Thani and the Makati Shangri-La, where I was treated like royalty and made to feel very welcome and safe. I don’t know if either hotel knew how much I love my food, but they both treated me to a meal at their respective Japanese restaurants and I think they might have had a slight inkling of my love for food once I was finished. 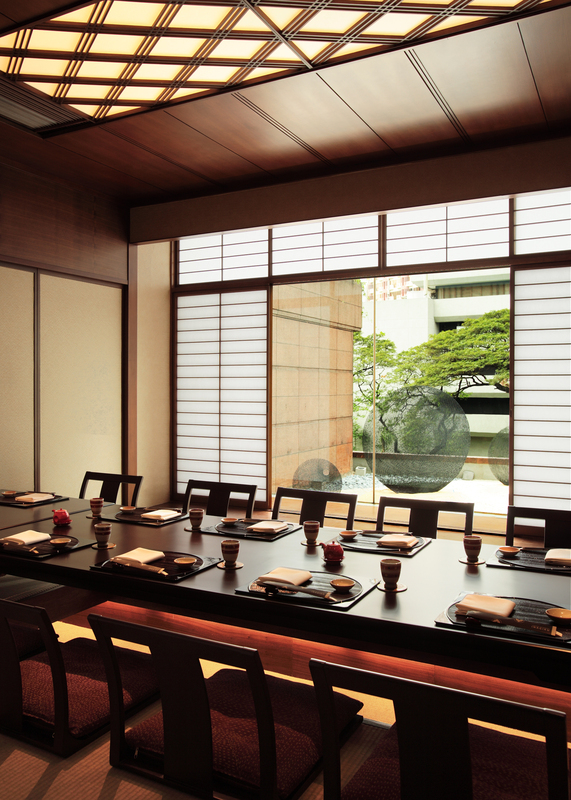 Umu, Dusit Thani’s award-winning Japanese restaurant, was renovated in 2009. It spans over a large space, accommodating over 200 diners, and has three separate traditional tatami rooms where diners can sit on mats on the floor. There is also a sushi counter, a robata counter and four teppanyaki tables. On the day I arrived in Manila, I had lunch at Umu with Danelle, the senior PR and events manager and Casey, the director of sales. We weren’t in a tatami room, but on actual chairs overlooking a beautiful garden and waterfall. At night, the garden is brought to life by strategically placed lighting and is even more beautiful. 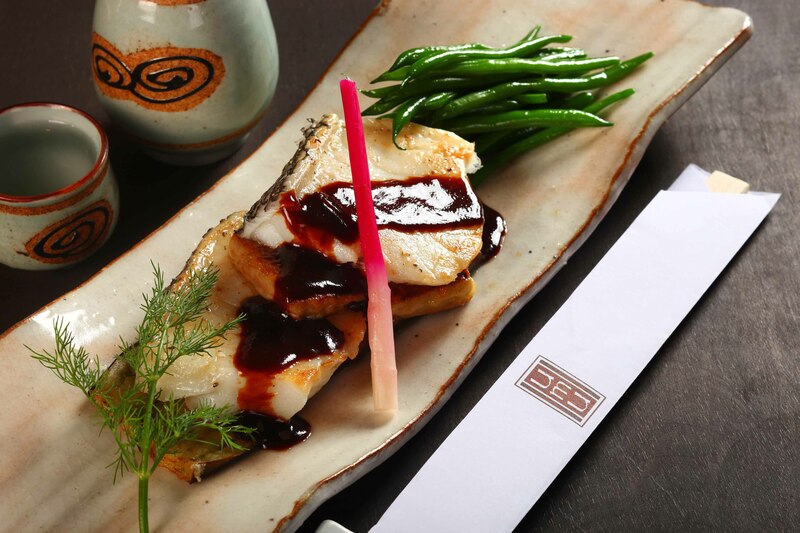 Umu’s menu is huge, ranging from traditional sushi to Japanese salads to tepanyaki dishes to wagyu steak. I handed the menu over to Danelle, told her I eat anything (apart from sea urchin – there’s something about eating a nasty little beast whose only purpose is to cause pain, which doesn’t appeal to me so much) and suggested she order the best things on the menu. I don’t know how good everything we didn’t order was, but the dishes she selected were definitely spectacular. The first dish to appear, whilst I sipped on my fresh green mango juice (amazing), was Sashimi Nanasyumori, a platter with seven different kinds of sashimi and several of each kind. This was not just a regular sashimi platter, however, as in the centre of the dish was a little box emitting dry ice, making quite the entrance. The sashimi itself was incredibly fresh and absolutely delicious, particularly the scallops which were separated by a thin sliver of lemon. Next up we had miso soup, ebi tempura (huuuge prawns in perfectly crisp tempura batter), suzuki seabass and foie gras, beautifully arranged and the flavours worked well together. The wagyu steak was lovely and tender but by this point I struggled to eat more than a couple of strips! Just when I thought I might pop, I was served the most amazing seafood fried rice which somehow found a little extra hole in my stomach. I think after giving up rice for 40 days over Lent, I am still welcoming it back into my life with open arms. Finally, as I had never tasted it before, my dining companions insisted I try the sake-flavoured ice cream. It was…. interesting. Not the most delicious ice cream I have ever tasted but definitely worth trying. The service was commendable and the company was amazing – the friendliness of Filipinos combined with the excellent Thai service employed by the Dusit Thani (a Thai branded hotel) is like no other. Even though the lunch was supposed to be business, I felt as if I was eating with great friends! Inagiku at the Makati Shangri-La is completely different to Umu so this is by no means a comparison. 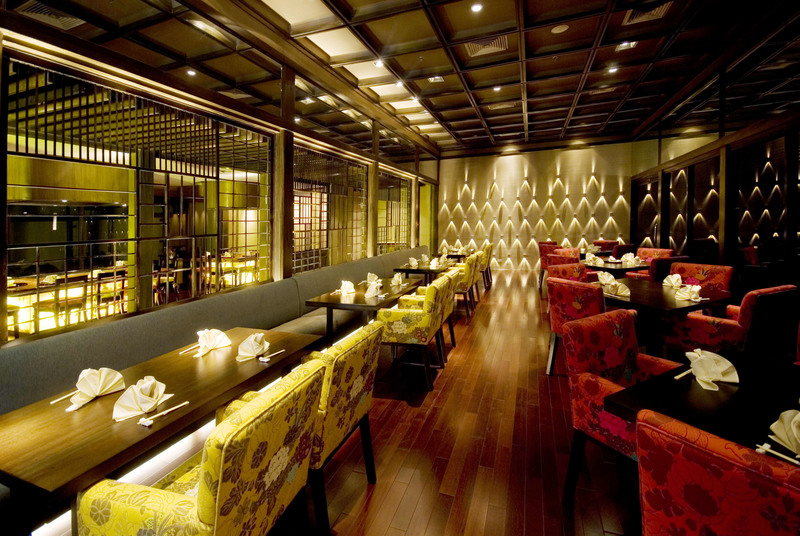 Apart from the two tatami rooms, the dining area is all contained in one smaller room. I had dinner here on my second night with Mica, the Shangri-La’s assistant communications manager. I was introduced to Ichikawasan, the friendliest restaurant manager, who, upon hearing that I live in Hong Kong, was adamant that, as HK offers pretty much every kind of cuisine, he wanted to select a menu for me comprising of dishes I was most likely to have never had in HK. So our menus were taken away from us, we were told to trust him (how could anyone not?!) and we were served dish upon dish of incredibly delicious and unusual Japanese cuisine. The only dish I had tasted before but am always more than happy to taste again were the edamame beans we were served whilst we waited. Following this, we each were given three pieces of sushi which Inagiku’s award-winning chef, Wataru Hikawa (apparently the MOST award-winning sushi chef outside of Japan) creates in his own special way: the three pieces of seafood (salmon, scallop and tuna) are marinated in a delicious sauce before being lightly grilled and served atop the sushi rice. Incredible melt-in-the-mouth goodness. Tuna tartare in a lovely sesame soy sauce (I LOVE sesame) was delightful. I neeeeeeed that recipe. The king prawns in Inagiku’s “special” sauce (I wasn’t allowed to know the secret ingredients, but was later told it was not the healthiest of sauces – oh well) were perfectly tender and the sauce was wonderfully buttery (ah, there’s the unhealthiness). Star of the show has got to be the seabass: it was placed in a large sheet of seaweed along with some shitake mushrooms and wrapped up before being covered in salt and baked. I had to stop talking at this point as it was unbelievably good. 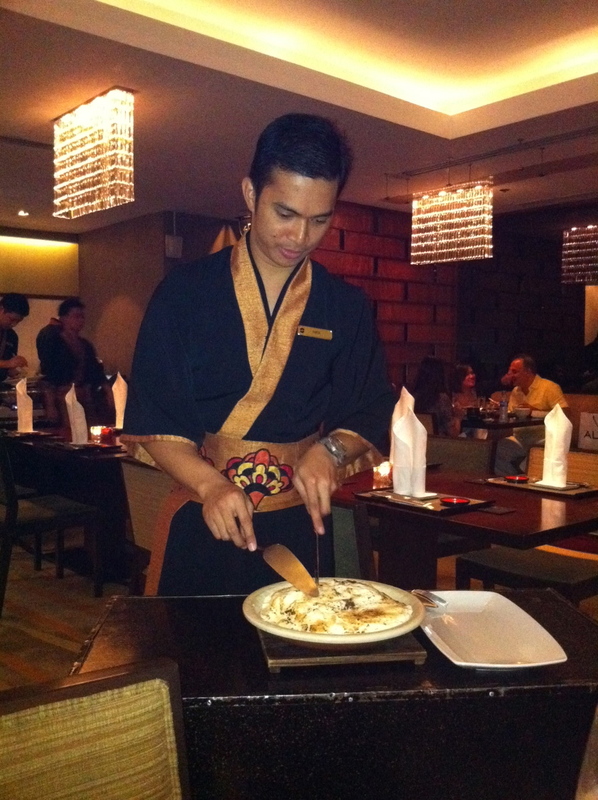 Below is a picture of our waiter carving it up for us. Although we were struggling to cope with any more food, we were each presented with a beautiful lacquer box containing cold udon noodles (this is not a complaint – they are supposed to be cold!). A small pot made of the same lacquer containing a soup-like sauce and condiments we were told was the dipping sauce for the noodles. I couldn’t manage them all but I would most definitely have them again. Last but by no means least, our dessert was a combination of sweet treats: fresh mango, fresh banana, red bean, a chocolate and pistachio crisp, mochi and a little ball of clear jelly with fresh strawberries inside. A-mazing and finished every last crumb even if I didn’t need it. Wonderful service and great company once again. I have no idea about the prices of either restaurant but I am almost 100% certain they are a lot lower than dining in an equivalent restaurant here in HK, but I think that goes without saying. So if you happen to find yourself in Manila, I would most definitely recommend giving these two lovely restaurants a try!